Sheltered Harbor -- a financial industry effort to improve sector-wide resilience in the face of a cyber attack -- today named Trey Maust as its new president and CEO. Sheltered Harbor — a financial industry effort to improve sector-wide resilience in the face of a cyber attack — today named Trey Maust as its new president and CEO. Maust is currently chairman of the American Bankers Association’s Community Bankers Council; he previously served as co-president and CEO of Lewis and Clark Bank, Oregon City, Ore. He remains executive vice chairman at the bank and will continue to serve as CBC chairman. “Leading an essential organization like Sheltered Harbor is truly an honor,” said Maust. 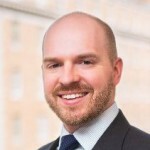 “With the entire financial services industry behind us, I look forward to channeling our collective resources into protecting U.S. consumers.” Maust was a founding board member of Sheltered Harbor, joining other ABA member bankers and staff in developing the new initiative over the past several years. A subsidiary of the Financial Services Information-Sharing and Analysis Center, Sheltered Harbor provides banks and credit unions of all sizes with backup customer account access should a cyber attack take down their institution’s website or systems. Another bank can then host the information so that the attacked bank’s customers can access their balances and funds. Through Sheltered Harbor specifications and processes, participating financial institutions securely store and quickly retrieve account information after an incident, supplementing the defenses banks already have by separating the information away from their own networks. Consumer data is stored and kept private by each institution, and is encrypted and protected from changes.